24 Oct 2018 --- Tipped as a “next-generation” smart labeling project aimed at dramatically cutting food waste across the perishable goods industry, a Time Temperature Indicator label (TTI) provides real-time information on a product’s condition throughout its supply chain journey. Using a green, amber and red traffic light system to highlight the condition of the goods, which highlights shelf-life issues. Using the amber-colored call-to-action function, the system also has the potential to save greater amounts of waste by alerting consumers to the condition of the goods as they deteriorate. The Centre for Process Innovation (CPI) – a UK-based center that helps companies to develop, prove, prototype and commercialize next-generation products and processes – is supporting this smart labeling project. Working in collaboration with SMEs Intray Limited and Mexar Limited, CPI is co-developing wet media formulations to ramp up production of the Oli-TecTM branded TTI. Existing sell-by, use-by and best before dates provide insufficient information and alerts to consumers on the shelf life status and degradation of goods, leading to greater risk of health hazards and increased waste, says CPI. Intray has developed the underpinning proof-of-principle for TTI label known as Oli-Tec. CPI is working alongside inkjet development company Mexar Limited to co-develop wet media formulations for various shelf-life timings, spread between two and 15 days. Operating out of its state-of-the-art formulation facilities at NETPark in the UK, CPI is also working on developing the models for the timing mechanisms of the label. Demonstration prototype labels will be generated, tested and evaluated, allowing Intray to carry out market trials ahead of a planned launch in 2020. “We are excited to work with Intray and Mexar to develop the next generation of food safety labels, supporting the development of the wet media and timing mechanism,” says Sarah Williams, Manager, Colloid Science at CPI. 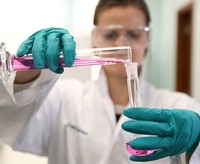 The 18-month project, backed by Innovate UK funding, is expected to help Intray leverage the UK’s formulation industry and strengthen manufacturing expertise by extending TTI use outside the food industry and into other areas, such as the pharmaceutical and medical sectors. “We are excited to work with CPI to allow for rigorous testing to ensure the timing mechanisms of the labels are accurate and repeatable,” explains Suzanna Hawkes, Director of Intray Limited. “Additionally, Intray is pleased to continue its long-standing partnership with Mexar in the development of the Oli-Tec label,” she adds. Food Waste Labels Temperature Time Indicator Innovate UK Oli-Tectm Intray Mexar Traffic Lights Green Amber Red Supply Chain Shelf Life.